The Story of the Middle Ages is a soft-bound 8-1/2×11 inch book of 356 pages. There are 148 chapters, with each chapter consisting of two to three pages of text. The cover art is “Gothic Cathedral with Imperial Palace” by Karl Friedrich Schinkel, 1815, housed in The Old National Gallery, Berlin, Germany. 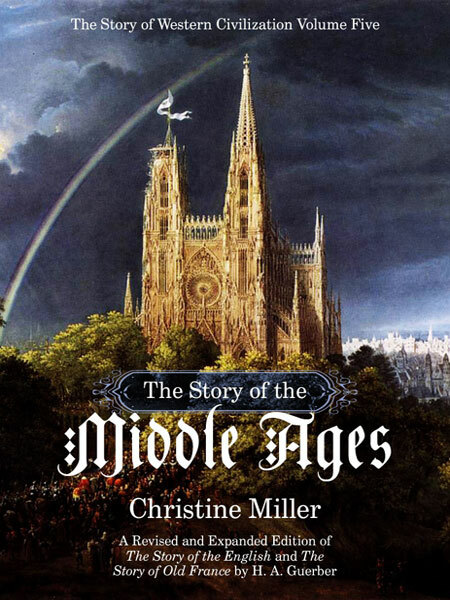 The Story of the Middle Ages opens by briefly reviewing the first inhabitants of Europe and the era of the Romans in a few chapters, settling in with the history of the Celts and Franks of Europe and proceeding from there past the fall of Rome in 476. It ends with the conclusion of the War of the Roses in England in 1485. This book, like all the others in Guerber’s history series, is meant for a child’s first introduction to the history of medieval Europe. It was written with third graders in mind, which is the age we recommend it is read (however, it still remains a child’s first introduction to history, no matter what age history study is begun). The independent reading level is about 10-12 years, so depending on the individual child’s reading ability, it may or may not be too advanced for a third grader to read independently, but very appropriate for a history read-aloud for any children in the elementary grades. Although we encourage everyone to use the Guerber histories, including The Story of the Middle Ages, with their children in the elementary grades, we have heard from many parents whose teens read these histories with great enthusiasm. Do you have a question about The Story of the Middle Ages?